Guest Post with Cristina Nika – Is Over-Countouring Damaging your Skin? Since the Kardashian clan patented the now much adored air-brushed look (the one that women started gushing over all around the world), putting on makeup entered a totally new dimension. Kim Kardashian’s signature look is often copied, yet somehow never successfully repeated. This sort of makeup involves a lot of high-quality products, a lot of time, a professional hand, and a lot of input. Without a doubt, not only is it expensive on so many levels but damaging for the skin too. There are those who would give anything for just a day with such a face on. No matter how old you are, contouring will age you extensively. 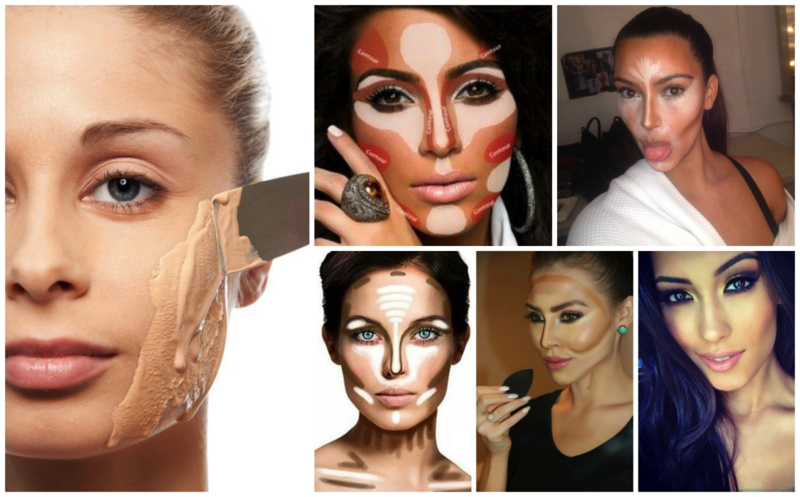 Contouring means applying too much makeup on your skin, starting with foundation (one, two, three), moving on to several types of concealer, highlighters, toning, etc. Add various shades of eyeshadows, brow makeup, lip makeup, mascara… and before you know it, you are ready to entertain a Broadway show while your skin is crying for help underneath all those layers of makeup paint. The more product you use, the faster will your skin wrinkle, the pores will close and your face will suffer major breakouts, redness and irritation. Contouring is a form of transformative makeup. Its point is to either emphasize the most beautiful parts of your face or completely change you features. And, you’ve got to have the respect for any makeup artist who knows how to do that. However, unless you are in constant public eye (even then), there is no need for so much makeup on your gorgeous face. What you need is a good foundation crème to nurture the skin, a bit of Aspect Pigment Punch to deal with all those spots, scars and age give-aways, liquid powder (or whichever one agrees with your skin) to give face an even glow, some blush for freshness and mascara for a clear look. Voila! You look wonderful! An average makeup session done by a professional takes for about an hour. With all the “Kardashian contorting” process – close to two hours. Are you actually telling me you’d trade your snooze button and a morning coffee for two hours of putting on makeup that will, in the long run, ruin your skin? Of course not! There is a time and place for everything, and countering should stay with those on stage. Your daily makeup routine should be quick, healthy and reflect your lifestyle. Whoever told you a lot of makeup will make you feel more beautiful – lied. A touch in the right places is enough.